How to clarify your priorities and achieve goals that matter. 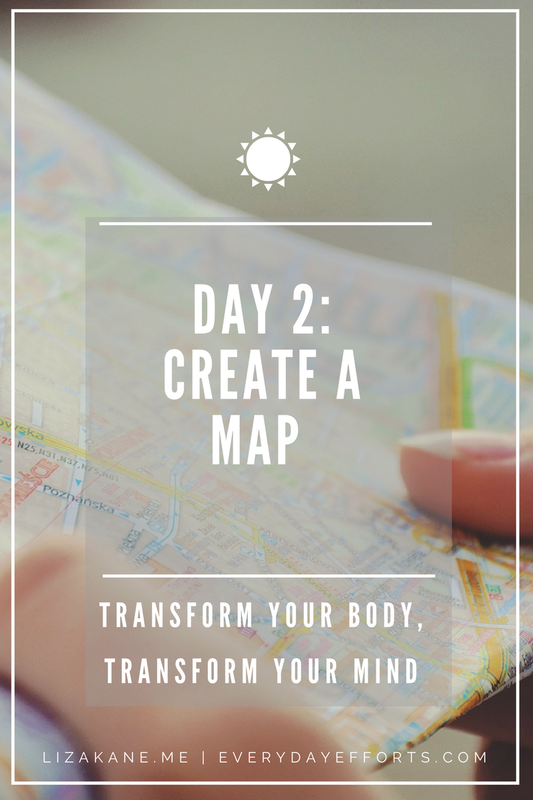 We’re on Day 3 of the 7-Day Transform Your Body, Transform Your Mind Challenge. Just a quick recap: On Day 1, we talked about starting with the end in mind and asking ourselves, “What is the Outcome we want?” From there, we created our MAP—brain vomiting all the tasks that we need to do and grouping them into manageable buckets using “What is the Outcome?” as our filter. The buckets you’re left with should resonate with you as a priority in your life. Today, we’ll be going a little bit deeper, and name and align our priorities into distinct categories. These categories are areas of continuous development, where each goal isn’t necessarily an endpoint, rather, when they are achieved becomes a gateway to the Next Level Up. These categories are important to clarify because whatever you choose to focus on will be what gets accomplished. So, let’s make sure the tasks you’re scheduling as your priorities, really are priority in your life. Sidenote: I like to call these areas my “Areas of Pride.” I take pride in being a good steward of what’s been given to me, and am empowered when I make changes that directly impact the Outcomes I wish to achieve. First, list the categories of personal improvement that are important to you. For example, the broad categories could be: Family, Friends, Physical, Emotional, Spiritual, Professional, Financial. Forever Partner in Love and Life. Loyal and Loving Family. Child of God. Lifelong Friendships. Constant Learner/Student. Physical Freedom. Financial Freedom. Generous Giver. Comfortable Home. This step is worth meditating and spending time on. Language changes our perceptions of things. I choose to use language that is empowering. For example, knowing that I want Physical Freedom makes exercise and clean eating almost a default response for me; there’s not the sense of deprivation or drudgery. Coupled with being a Constant Learner, I actually make a game out of finding new exercise techniques and healthy recipes. Then, rank where you are in your categories on a scale of 0-10. If you’re feeling really good about your relationships, they may be an 8 or higher. Maybe you’re feeling so-so about your business, so you’d rank it a 5 or 6. If you don’t remember the last time you had a vegetable, then your physical or health category may be a 2 or 3. Try to be as objective as possible. This is not about guilt. The point is to honestly assess yourself in the areas that are important to you and see where there are gaps. Remember: you will make progress on whatever you focus on. These are the areas that produce the most important Outcomes in your life. The areas that have the lowest rank can now be your new current priority. 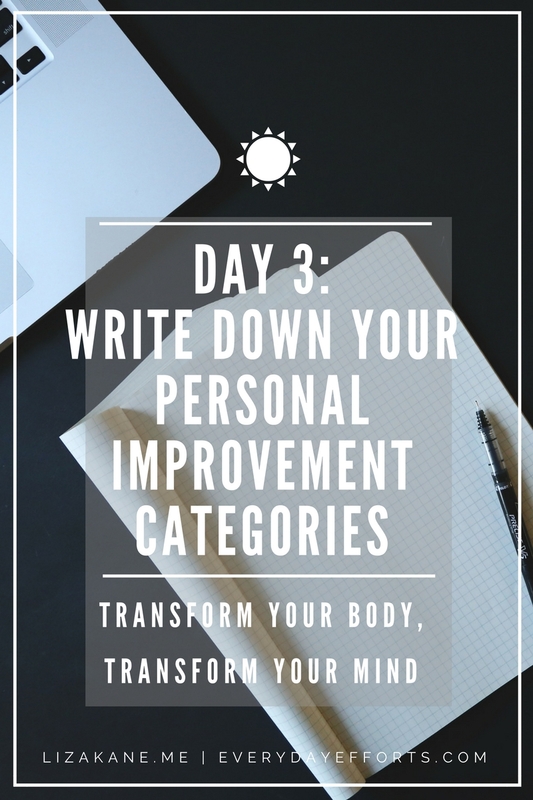 Now it’s your turn: Write down your personal improvement categories in words that resonates with you the most! Please share your insights in the comments below, or feel free to use the image to post on Instagram, Facebook, and/or Twitter with the hashtag #TransformIn2017. Wednesday is a rest day, so, do the Warm-up routine, and the Cool-down routine, then drink your smoothie! Stop endless to do lists. Create a MAP to your goals. Today is Day 2 of the 7-Day “Transform Your Body, Transform Your Mind” Challenge, and I’m so happy you’re here with me! This question is then followed by asking “Why?” Why do you want this goal? Why now? So, now that you know what you want and why you want it, let’s talk about the next step: How? Easy! We create a MAP! Now, this is where you might be tempted to break out your planners and bullet journals and go to town scheduling tasks and activities that could potentially overwhelm us. We won’t do that yet, but when we do, we will feel a lot more in control over our day. Instead of figuring out where you can fit tasks into your overloaded days, do a brain dump of all the stuff that’s cluttering your head. Write out all the tasks that you think you’ll need to get done or the activities that you know you need to do on a piece of paper. Don’t censor your thoughts. If it’s a phone call to the doctor or writing a marketing campaign or going to the office supply store, whatever to-do’s that need to get done today, this week, this month, etc, write them out. It may seem like I just created more stress for you because you just vomited out 30 activities that need to happen before the end of the day, but this step is important because your Why changes your How. Then, go through the brain vomit and group together activities and tasks. Maybe they can be grouped together by location, time, deadlines, or they could even be delegated out. And some could be crossed off your list altogether because you realize that you don’t need to do that activity after all. So now, instead of 30 tasks staring back at you, you actually only have 3 or 4 activities because they have been grouped together. After you do that, you calendarize the activities, complete with assigning a time budget to the activity as you would a monetary budget. Perception around the degree of difficulty of a project or goal circles around how many steps it takes to complete a task. When we complain about a new goal, like working out or cooking whole foods, we go through an elaborate story about all the intricate steps that need to happen in order to complete our routine. Creating a MAP like this make take a lot longer than scheduling appointments and tasks into your favorite planner, but what you get out of it is a system that tells you if you even need those appointments or tasks in the first place. Maybe you realize that the way you were told to do a project is actually not efficient, and you could probably cut a lot of steps in the middle and still come to the same outcome. Or, maybe you realize that the project that seemed to be the Hot Project, should actually be delayed and traded up with another project that could give you better leads or return on your investment. When you are guided by your Why, the How to get to your outcome will feel freer and dynamic. You’ll feel more in control over your time and decisions, instead of feeling like the day is running you. When you know your Outcome and Why you’re doing it, you can easily filter all the white noise of your life into manageable groups of activities. Your processes will become more efficient, and you will eventually make quicker progress toward your goals. Your Turn: Please share your insights in the comments below, or feel free to use the image to post on Instagram, Facebook, and/or Twitter with the hashtag #TransformIn2017. 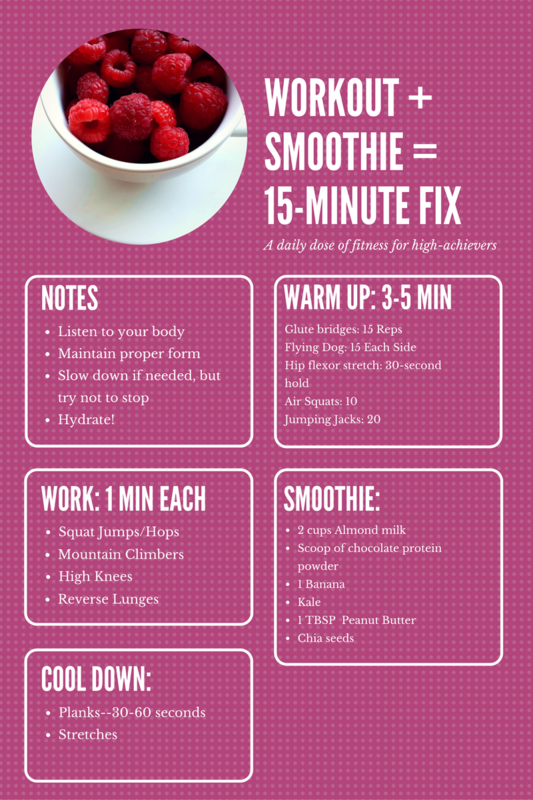 For those of you who wanted daily workout inspiration, here is the workout + smoothie for tomorrow’s 15-Minute Fix. Let me know if you have any questions in the comments below, or you could also fill out this form! Thank you and I’ll see you again tomorrow!